Crusaders's lead at the top of the Irish Premiership is cut to four points after a 1-1 with Dungannon at Stangmore Park. 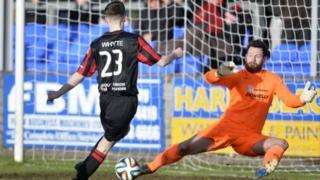 With second-placed Linfield beating Ballymena, Crues were left to rue a series of missed chances before Ryan Harpur put the Swifts ahead on 57. Paul Heatley levelled for the leaders on 60 but they failed to convert other late chances as the Swifts held firm. Linfield also have a game in hand on Stephen Baxter's side.